She says insider loans formed 97 per cent of the bank's portfolio. 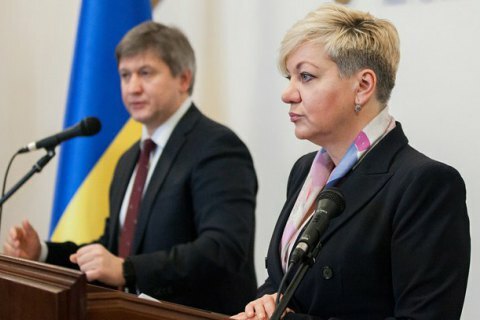 National Bank of Ukraine (NBU) governor Valeriya Hontareva has said that Privatbank has been nationalized because its capital is short of 148bn hryvnyas. She was speaking at a briefing on Monday, 19 December. "Over two years ago, the National Bank launched the diagnostics of assets and need for additional capitalization of banks, which is the most thorough one in the history of the Ukrainian banking sector. By now, 60 per cent of stress tests of the largest financial institutions, which together constitute 98 per cent of our banking sector, have been completed. The NBU's inspections exposed Privatbank's shortage of capital. As of 1 April 2015, it was 113bn hryvnyas," she said. She explained this was a result of the Ukrainian economic crisis and the bank's wrong credit policy. "Over 97 per cent of its corporate portfolio, which reached 150bn hryvnyas as of 1 April 2015, were loans associated with the company's shareholders," she said. The bank's management developed a plan of measures to increase capitalization and reduce the volume of insider loans. The bank's shareholders personally guaranteed the implementation of the programme, however it has not fallen through. "Over the past year, the National Bank has had over 30 meetings with the owners and management of the financial institution. The National Bank repeatedly extended the term of decapitalization. By 1 December 2016, the bank has grown short of 148bn hryvnyas while its liquidity has decreased significantly. For almost a year, the bank has not carried out mandatory norms of reserves while its outstanding payments to the regulator on stabilization loans made 14bn hryvnyas, the total debt 19bn hryvnyas," she said. Hontareva said that the situation is under control now. The National Bank will provide Privatbank with funds required to ensure all the necessary payments to its depositors. On 18 December, the Ukrainian government decided to nationalize Privatbank. The state will own 100 per cent of the bank's shares. Privatbank's shareholders are Dnipropetrovsk businessmen Ihor Kolomoyskyy and Hennadiy Boholyubov.